also, this happened. | everything will turn out alright. This entry was posted in Uncategorized and tagged firsts, santa. Bookmark the permalink. This is probably the cutest Santa picture I’ve ever seen! Look at her face! ps- she totally looks like you in this picture. I don’t know why- but it just jumped right out at me in this particular photo. Hahaha. Thanks. I’ve been told she is looking more like me these days. I think she still looks a lot like her daddy though. i can’t wait to do this! she is so cute…i love her poka-dot-pants! I can’t wait to see the picture of Aydan! bahaha this looks so much like a photo from the 80’s or 90’s both look a little unsure of what they are supposed to be doing. It does! This Santa seemed a little unsure of what to do with her. He kept shifting her around awkwardly. ack! so cute! 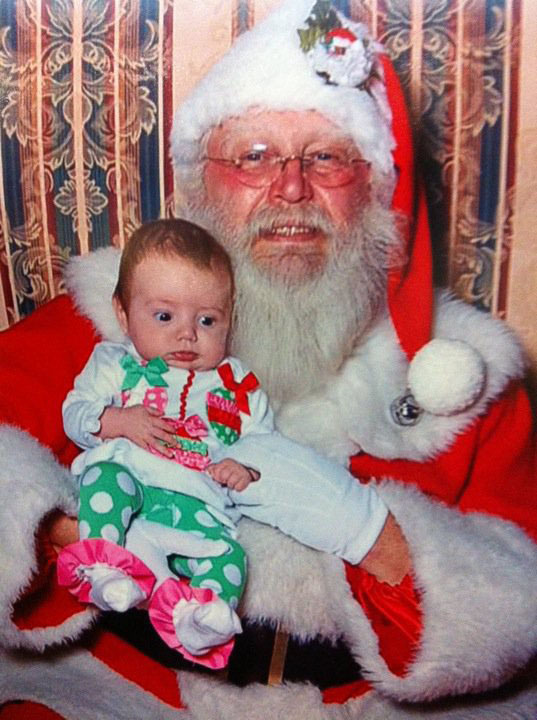 we just did the baby’s-first-time-on-santa’s-lap thing, too. is it bad that was kind of hoping for a crying baby & santa picture? probably. in any case, this is such an adorable shot–priceless! I was totally hoping for a stronger reaction to Santa! She was completely unfazed.